After we joined Twitter, you knew this was next. 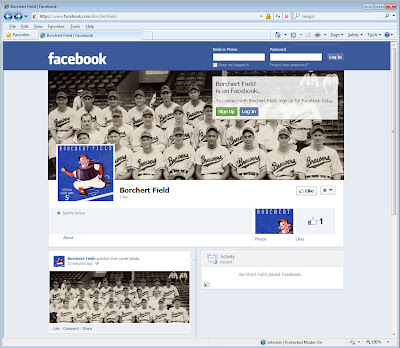 BorchertField.com is now on Facebook! Give us a "Like", and stay connected to all the goings-on at BorchertField.com. One of the marvels of this blog has been my ability to connect with others interested in the Brews and Milwaukee's baseball history as a whole. Twitter has already helped with that, and I'm looking forward to see what Facebook can add.